Why build a road five miles into the wilderness? About 350 years ago, a shipload of travelers landed on the northeast coast of America. According to one author, the first year they established a town site. The next year they elected a town government. The third year the town government planned to build a road five miles westward into the wilderness. In the fourth year the people tried to impeach their town government because they thought it was a waste of public funds to build a road five miles into a wilderness. Who needed to go there? What happened to these people? History has validated the foresight of the town government. But, what made the people, who most likely spent years planning their pilgrimage to this land in which they envisioned new opportunities, become so short-sighted so soon? During those early years, they had known their struggles. Hardship, heartache and disappointment had been their constant companions. The extreme hardships they experienced, no doubt, took their toll on their spirits. They surely had their share of heartache, too. During this time, every family had likely known the heart-hammering pain of the death of at least one loved one. And, who can list the number of disappointments they had known? Frequent setbacks, multiple heartaches and hounding hardships have a way of squelching the pioneering spirit. They leave people feeling deflated, defeated and in despair. In the face of such circumstances people are hardly able to focus on much more than surviving another day. Indeed, survival for these people was not something to be fictionalized or trivialized. Survival, for them, had become everything—the only thing. Their concern for survival moved them to become self-absorbed. They could not see beyond their own interests and concerns to consider the needs of the next generation, much less generations to come. These historical events are a microcosm of life. Though we are not faced with the same circumstances, what happened to these people often happens to us in our pilgrimage on earth. We have struggles that are just as real. Sometimes survival is just as much an issue for us as it was for them. As it did for them, these circumstances rob us of one of the most cherishable aspects of our Christian life. Hope is the context in which thoughts of a brighter tomorrow are developed today. Hope opens the door to opportunity. Hope beckons us to desire and expect great purposes to come to fruition in our lives. Hope causes us to lift up our self-absorbed eyes and see the possibilities for others—even those ensnared in sin. Hope challenges us to look beyond our present pain to the comforting embrace of a loving Father who truly cares. Hope springs from the open and empty tomb; and declares with a clarion voice that God is able to do immeasurably more than all that we ask or imagine, according to His power that is at work within us. 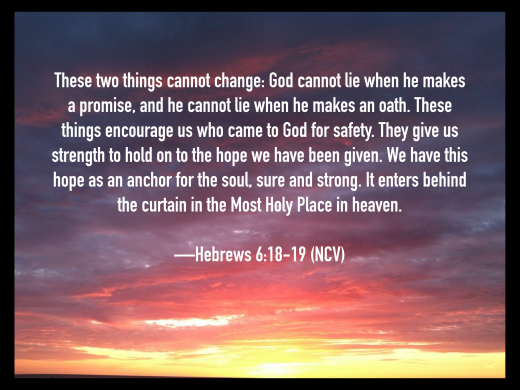 Hope anchors our souls firmly in heaven, where Christ is, seated at the right hand of God. Thus, hope compels us to build for the future. Hope counsels: Plant trees from which others will enjoy the fruit. Pave roads on which others will drive. Hope affirms there is more to life than the here-and-now. Live like it! Where there is hope for tomorrow we can envision brighter days ahead. Why? Because, vision is like a bridge between the present and the future; and hope gives us the impetus to build that bridge. These early settlers in America seem to have gotten caught up in themselves and their circumstances, at least temporarily. Their hope for a brighter future appears to have been fading fast. Consequently, they could not see even five miles down the road. —What roads need to be built in your life? —What is holding you back? —What has clouded your vision for the future? Don’t give up. Don’t give out. Don’t give in. There is Good News! The tomb was open and empty. Jesus has gone to be with the Father in heaven. Your hope is anchored in Him there. Never stop hoping; never stop envisioning a brighter future; and, never stop building bridges until you join Him there.